It seems like every time my cat uses the litter box, I end up sweeping up chunks of litter. She can’t help it if she makes a little mess here and there, but it would make my life a whole lot easier if things weren’t so messy. Lucky for me, litter boxes have advanced a lot recently, and in this review, I'll be introducing you to my latest cat gadget. Can I use the Modkat for larger cats? What About Kittens? Is This Suitable? This cute little box looks sleek and stylish while providing a perfect way for your cat to do their business without making a mess. 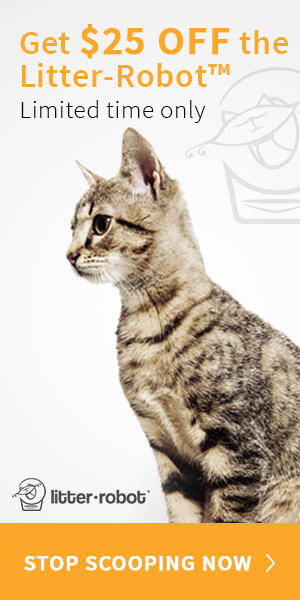 Modko makes award-winning litter boxes that look great and just about prevent litter tracking. They’ve considered everything when it comes to you and your cat, including features you wouldn’t even think about, like a locking lid to act as a mat that traps excess litter. I took a look at the box itself, and if I didn’t know it was a litter box, I never would have assumed that it was! Modko works hard to give you a design that’ll look great in any home while providing your cat just what they need. With a hole in the top for your cat to jump in and jump out and a place to hang the scooper, there’s no more mess for you. Your cat can dig as much as possible and you won’t ever have to see it! Modko makes their box in a variety of colors, with a seamless base to eliminate leaks, a design meant to reduce litter tracking, and a reusable tarp liner that cleans and transports litter easily. The top even opens at an angle to prevent excess litter from leaking when you scoop it out. Did I mention that it was dog proof too? When you buy a litter box, you not only have to buy the box, but also the liners, the scoop, and probably some air freshener to go along with it. When you buy the Modkat box, everything is included. Its full height, including the reusable liner, the easy open lid, and a hanging ergonomic scoop. Its sleek design makes it completely dog proof while giving your cat some privacy to do their business. This patented design gives both you and your cat everything you need to live in a clean, litter-free home! Just grab your liner, dump the litter, and reuse it again and again. Scoop the litter with the easy to use the handle and watch the mess simply disappear. Also known for its super tough liner, the Modkat liner is made of heavy duty tarpaulin which really helps those of us who are so sick of less-than-satisfactory liners. Rip-resistant and super easy to clean, it measures 10 inches tall and even has handles so you can move it easily and pour easily. Dogs can't get into it and wreck havoc! In general, customers love the Modkat Litter box. Sara said she was nervous about buying something so expensive just for her cat to go to the bathroom in, but her only regret was that she didn’t make the purchase sooner. Her larger, more easily confused cats picked up on what to do right away, and had absolutely no problems using the box. She loved how sleek it looked so her house guests didn’t pick up the “cat lady vibe” right away. Other reviewers agree wholeheartedly, loving the way it keeps litter in while keeping dogs, and small children, out. For the most part, the main issue was the price. Brian mentioned that he felt that he could have gotten something a little cheaper that would do the same thing, and that it might be best to buy a cheaper model that’s similar to see if your cat adjusts properly. He loved the box, but his cats would no longer bury their waste, leading to a smell problem. Penny agreed with his review, mentioning that she would have been fine with all of that if her cats didn’t still track litter everywhere. According to her, only about 60% of tracking was actually eliminated when she paid for 100%. If your cat is a little older and doesn’t jump around as much, I would advise you to consider that the Modkat might not be as suitable. If you have a friend/relative who owns a Modkat, you might want to borrow it to see if your elderly cat will take to it first. If your cat loves jumping up on window sills or climbing into boxes, ​your cat will probably love the Modkat! The Modkat was designed based on the principles that cats naturally love to explore and peek inside things/boxes. The Modkat Litter Box is sleek, simple, and easy for both cats and humans to use. Like any product, there are some issues, but it’s up to you to consider just what you need out of your litter box when you get down to buying. Many people said the product was more than worth the price, and if it helps keep your house clean, it might be the next great solution for your litter box problems!